Fresh, local, nirvana on a plate . . . if you delight in finding a great new farm-to-table restaurant or a local diner with an urban flair, or a roadside market selling produce that an hour ago was growing in the neighboring field, then you will love this flavorful trip up the Byway. At the east end of Route 28 check out the farm markets that are open year round. Bacon like you have never tasted, lamb, pork and beef from farms just a few miles away, eggs with the brightest yoke imaginable and fiddleheads harvested during a walk in the woods. Boiceville: Brick oven breads of every description are available at the legendary Bread Alone Bakery which has been making organic breads and fine baked goods at this location since 1983. Mt. Tremper, Phoenicia, Big Indian and Pine Hill: Several restaurants, each with a distinctive personality, serve up locally-sourced meals and brews. Fleischmanns: From the east, stop at the country store/gas station for a delicious eclectic American menu with plenty of Mexican items as well. Continue a short distance down Main Street for a French Moroccan vegetarian meal by the creek or just have a café surrounded by the art. Our two Mexican restaurants with unique menu items are located in the center of town. Enjoy the beautiful historic Village Park and its accessible playground before leaving by Depot Street for a sweet ice cream treat, authentic egg cream, pizza, steaks or BBQ before turning back onto the byway. Arkville: Union Grove Distillery opened in 2015 and its first product, a fabulous apple vodka, has gotten rave reviews. The apples were pressed at the historic cider mill at Hubbell Homestead Farm in Kelly Corners. . . . Ready for a unique on-farm experience? Venture off the Byway up Dry Brook Road to Rider Hollow to enjoy pizza (local cheese and veggies!) cooked in an outdoor oven and served up on picnic tables at Lazy Crazy Acres. Livestock petting optional. Halcottsville: The Pakatakan Farmers’ Market is THE place to be on Saturdays from mid-May to Columbus Day. Dozens of vendors occupy the Kelly Brothers Round Barn, which is listed on the State and National Registers of Historic Places. Stop to see the scale model of the barn and photos from the days when it was an active dairy, then do some serious food shopping! Corn, berries, bread, cheese, meats, mushrooms, smoked trout, salsa and other local specialties. Margaretville: Peruse specialty and gourmet food shops where handmade chocolates, waffles, ice cream, specialty coffees, locally produced wine, spirits and cider are available. . . . Stop at the local auction house to see what’s happening, and while you’re there pick up a home-made pie at the adjacent farm store. Venture off onto the side roads and be surprised at family stands selling backyard honey, maple syrup, and eggs from free ranging hens. Andes: A farm market pops up in the middle of town during summer months; a more permanent agricultural operation – a goat cheese plant – will soon open at the edge of the village, and a brewery is in the works. 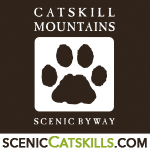 So come explore the Byway, and satisfy your appetite for all things Catskills’-fresh!